Please Log In to access client features. We did it again! Announced at World Dairy Expo, DRMS won a third Innovation Award from Dairy Herd Management for the Heifer Genetics Monitor report. The Monitor helps determine the genetic value of both current heifers and heifers expected to be born soon. Two lists help with: 1) culling and breeding decisions for current heifers and 2) preparing for the offspring of pregnant heifers and cows. Both lists provide a Projected Heifer Cow Rank based on either the heifer’s parent average for Merit$ or her own genomic Merit$. 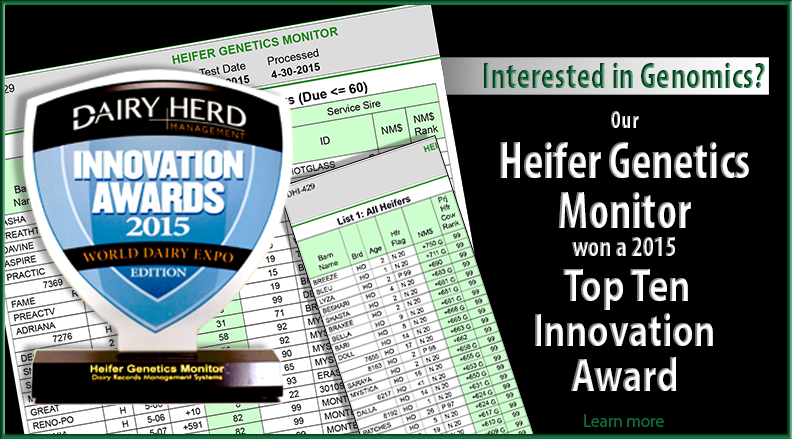 See the Heifer Genetics Monitor Review for more details on this award-winning report! Vet Check Maxx was awarded a Top-10 New Product for World Ag Expo. It's vet check time - ditch your clipboard and grab an Android tablet with the PocketDairy app! Vet Check Maxx provides all data needed cowside on one screen. View and give info to vet, input findings, done! You can enter Repro, Health Remarks, assign protocols and report chores done cowside. Enter once and sync to PCDART. More efficient, more accurate. Take your herd checks to the Maxx! How do you get the newest version of PocketDairy? If you currently have PocketDairy installed on your device: 1) Tap on Settings | About PocketDairy; 2) Tap on Program Version. PocketDairy will download the latest version of the apk and update. Have a new tablet and want to install this new version? Open the browser on your tablet and navigate to www.drms.org\pd. The pocketdairy.apk file will automatically start downloading. Learn more now! Simplify and streamline your vet check days with Vet Check Maxx! Want to learn more about PCDART? Log in and click on Educational Videos-Features to access over 20 short videos on various PCDART features. Click on the webinar title to access recorded webinars. See PCDART featured in Dairy Herd Network’s Precision Dairy Digital Buyer’s Guide. Due to its ability to integrate with most on-farm automated milk recording, robotic and heat monitoring systems, PCDART is at the forefront of the precision dairying movement. Get the most of your investment in technology by linking PCDART with your precision dairying equipment. Heifer Genomics Guide Our industry is on the genomics fast track. Dairy producers are testing heifers at an ever-increasing rate. Now, what to do with all this genomic data? This new report helps producers answer important questions such as: Which heifers should I test? Which heifers should be the dams of the next generation? Which heifers are good flush candidates? Which heifers should be culled to save costs? See the Heifer Genomics Guide Review for more details. Udder Health Monitor: Quickly evaluate your herd's udder health with the graphs, tables and lists provided in this report. You will have the tools to reduce costs, increase milk value, and comply with an expected reduction of regulatory somatic cell limit already required by some milk cooperatives. See the Udder Health Monitor Review for more details.